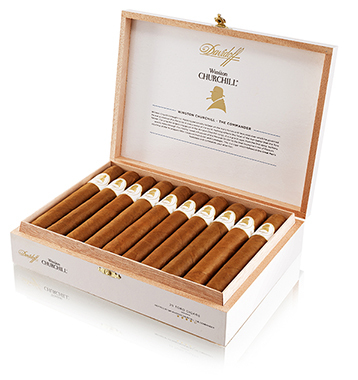 Davidoff of Geneva has relaunched the Winston Churchill cigar brand of 2007 with an entirely reblended and repackaged line that cannot be mistaken for the "original." Named after one of the world's most notable cigar icons with permission from Churchill's grandson Winston S. Churchill, it is the only cigar to bear Winston Churchill's name. As complex as the man himself, this range of some of the finest cigars in the world is inspired by the iconic aficionado, each celebrating a different aspect of his richly complex character as noted below. Two filler tobaccos from Esteli and Condegas, Nicaragua, and three from the Dominican Republic are bound by Mexican leaf and married to an oily, silky wrapper from Ecuador for a memorable medium- to full-bodied, full-flavored smoking adventure. The cigars are hand rolled at the Davidoff cigar factory in the Dominican Republic and presented in beautiful white wooden boxes with Winston Churchill's silhouette prominently displayed. The Aristocrat (Churchill) offers a long and sophisticated smoke with notes of chili pepper followed by pronounced leather and roasted flavors. The Artist (Petit Corona) is small, but intense, and shares roasted peppery oakwood notes. The Commander (Toro) is full of spice, leather, and wood notes followed by creamy, sweet influences. The Statesman (Robusto) is a harmony of balanced leather and dark coffee flavors.